Click the button below to add the T-SHIRT, MEN'S SHORT SLEEVE TRI-BLEND to your wish list. The perfect ultra comfy tee crafted from three yarns for carefree style. 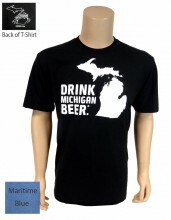 Drink Michigan Beer logo screened on the front in white. Michigan the Great Beer State logo on the back yoke.